Hi there guys. The blog has been quiet as hell as of late because the boss is quite busy and... I kind of had some things to do back in January and I got too lazy I guess. But as of now I'm a full-blown NEET and ready to write reviews to fill up on the boss. Its been a while since I talked about a game so I thought, why not do another just for fun? So here you go. 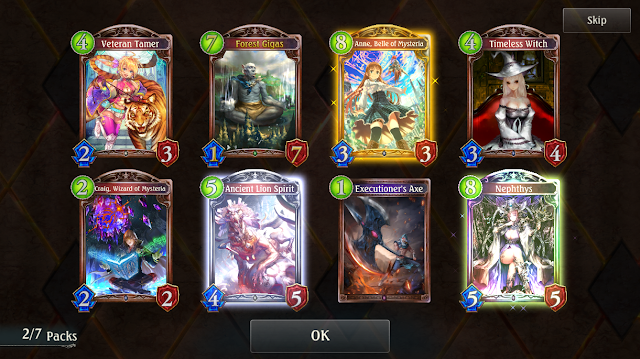 Shadowverse. Below, I did say its a mobile title but its also available on Steam. P/S: No, Cygames did not sponsor me to make this article or anything. Shadowverse is a collectible card game (CCG) made by Cygames, the creator of the mobile game, Rage of Bahamut (RoB). Some of you might know it from the anime a few years back or from playing the other title made by this company, Granblue Fantasy. 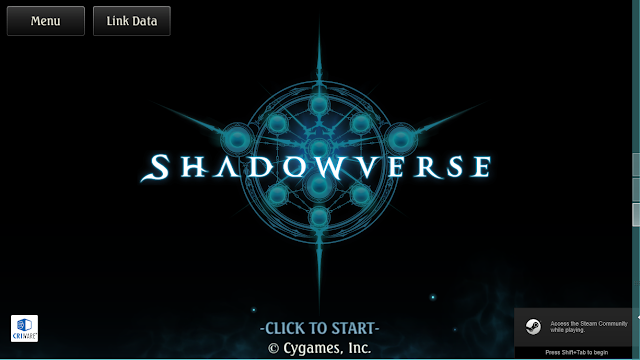 Like Rage of Bahamut, Shadowverse is also a mobile game title and its free to play (with in-game purchases of course). #Funfact: Boss and me played RoB some years back before it got shut down. Yes Rage of Bahamut got shut down a few years ago. 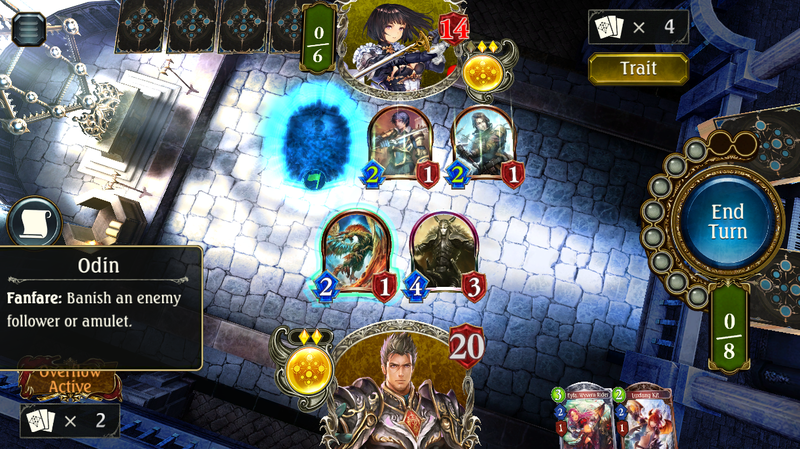 Now before you read this further, Shadowverse is a card game. If you don't like card games or don't prefer them per se, move along. There's nothing to see here. I didn't play a lot of CCGs but the ones I did play have quite confusing user interfaces. 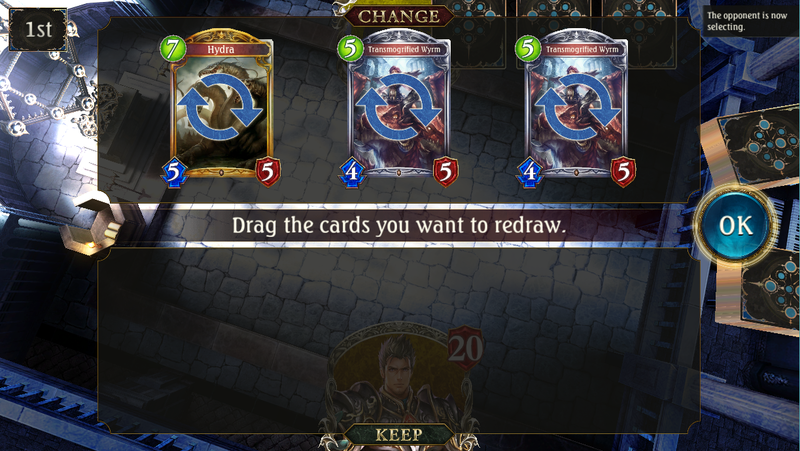 Shadowverse's interface is very clean. All the tabs are laid out at the bottom and and at the right side of the screen. In the middle, a flashy preview of your most recent deck. On the top right side of the screen you can see the two currencies of the game, gold and crystal, the latter being premium currency and obviously on the left side is my name. As a lot of other card games are, this game provides players with seven different factions to play with plus one neutral faction. The seven factions each have their own specialties and ways of utilizing them to the best of their abilities. 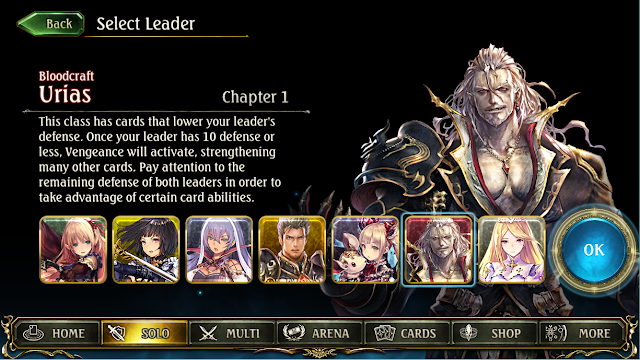 Heck there's even a story line for each of the factions that tells the tale of Shadowverse from seven different perspectives. I mean I was really impressed. Not many free to play card games do this. Giving an in-depth story to each factions and REWARDING them for actually playing the story is something really special about Shadowverse. Oh and believe me you, the story AI aren't chumps. They'll wreck you so hard you'll actually have to bleed your brains out to play against them. 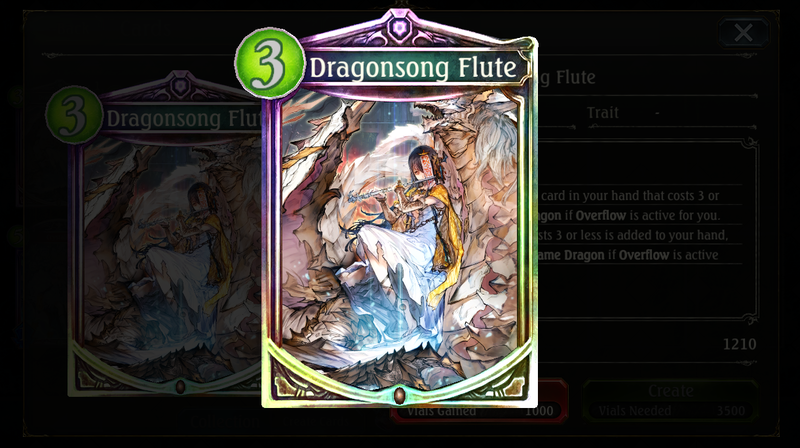 Another unique aspect of Shadowverse is its card crafting method. Its quite simple, really. You burn unwanted/extra cards, get vials (crafting currency), then use the vials to craft cards that you want instead. Of course the ratio of burning to creating cards is a bit steep, but still, its very very possible. You can easily build a working deck this way. I know. I tried. One other game that does it similar to Shadowverse is The Elder Scrolls: Legends (also another CCG). If this one gets a decent view, maybe I'll do a review on that game as well. You think I'm done talking about the nice things? No. No I'm not. Shadowverse is fairly generous in terms of providing cosmetics to players. Did you notice the icon beside my name earlier? 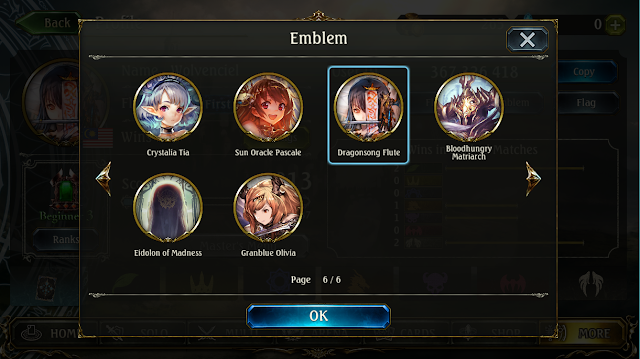 Those are called emblems. There are preset ones provided of course but you can get more if you manage to pull certain cards from booster packs. These are the ones I managed to get. The Granblue Olivia is a time-limited event emblem by the way. Not to mention they also give away card sleeves as reward for completing the story, completing missions and playing ranked games. The only thing left to customize here would be the field. Yeah, players can't choose that. Playing fields are generated at random. So here is how the playing field look like. You can see your leader (you can also customize your leaders) there and all the other stuff (which I'm not going to explain as this isn't a tutorial). The cards themselves don't actually animate but when you use them to attack or activate their effects, sparks start to fly. Gusts of wind, thunderbolts, fireballs, you name it. That's an animation of the effect "Banish". There's also a lightning spear effect but it was too fast I couldn't capture it. Oh and did I mention that all the cards are fully voiced? They talk when you summon them, use them to attack, evolve and of course, when they die. 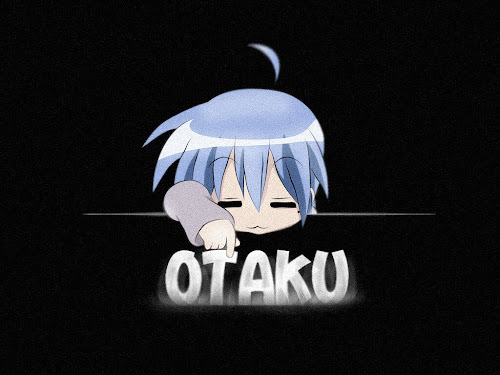 Sure, some of the voice acting aren't exactly stellar but still its better than nothing. You'd be surprised how full of character some of the cards are. As you listen to the cards' voices, you'll also notice that some of them are just too overpowered. Well... Not exactly overpowered but they're really hard to get around. I get it though. The game is fairly young so it has a lot of rough edges. The game has only three types of booster packs as of today and you'll realize that there isn't much customization you can do to make a competitively creative deck. Not yet anyways. Oh and your starting hand is 3 cards + 1 (if you go first) or +2 (if you go second). 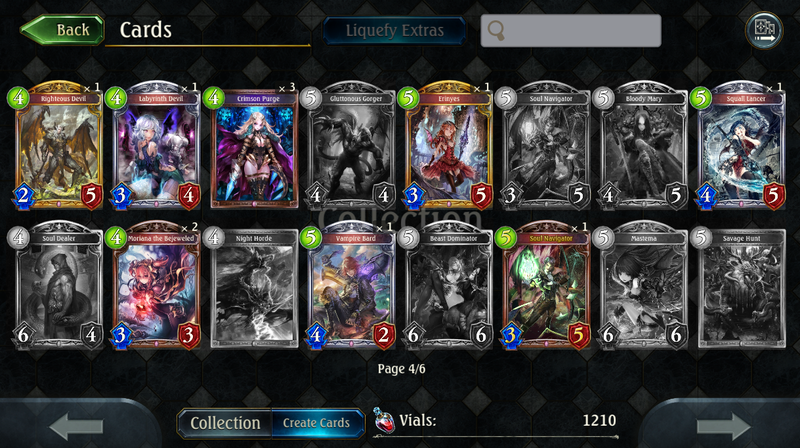 I'm not going to spoil much, but if you do try the game, watch out for Enstatued Seraph (Havencraft) and Mordecai The Duelist (Shadowcraft). These two are probably a bit too much to handle if you're new to the game. There you have it. 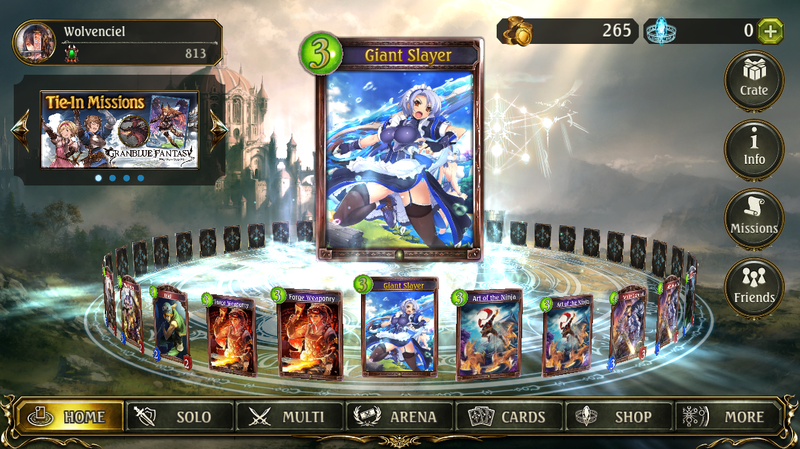 Shadowverse is perfect if you're looking for a CCG to play and if you do try it now, there's a special collaboration event with Granblue Fantasy. Its not much yet but I'm looking forward to what the game has to offer in the future. For now I'll just enjoy the game casually. Oh and of course, if you're up for a duel, do tell. See you next review.